Well Baby is 7 months old today. I can’t believe it, the time has flown by. She now has 6 teeth (4 top and two bottom) and is developing her personality at the speed of light, she is so cheeky and smiley. She is very confident and is never still. This month has seen her learn to roll back (from tummy to back) and also to roll to her left (has always favoured going to her right). She is definitely a morning person and we sometimes struggle with the last one to two hours before bed, as she starts to go a bit crazy. However, trying to get her to sleep longer than 5.30am is a challenge! We continue slowly with weaning. She sometimes refuses and doesn’t eat very much really. I try not to worry as she still has loads of milk and hasn’t dropped any bottles. But I wish she was keener. Night sleeping is a random experience. Some nights she sleeps from 6.45pm to 5.15am (this has been the longest she has done) and others she is awake at midnight. She is desperately trying to make new sounds. If you sing to her, she gets so close to your face and stares intently at your mouth. She is using the front of her mouth much more now to make sounds and said Ba Ba the other day. She likes to scream and test her lungs (I think she thinks she is singing), which can be quite challenging, as she likes to do a full set!. 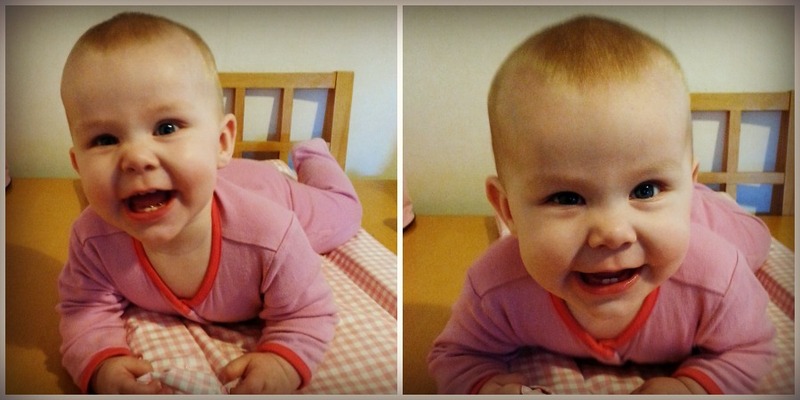 She can almost sit independently, loves to try standing and bouncing is her favourite thing. She can’t crawl yet, but she is trying really hard. Some people would call her inquisitive, but I say she is nosy. She will do stomach crunches and crane her neck to see out of the car seat, if she hears something interesting. She stares at adults when they are speaking like she is understanding every word. Her smile. Well her smile is amazing, heart melting and is the best thing I have ever seen. She can brighten the dullest, hardest of days with a tiny flicker. Her face literally lights up with joy and you can’t help but feel the same. I am truly blessed that I am her mummy.